Bible Text: 1 Samuel 2:6-9 – “The Lord killeth, and maketh alive: he bringeth down to the grave, and bringeth up.7 The Lord maketh poor, and maketh rich: he bringeth low, and lifteth up.8 He raiseth up the poor out of the dust, and lifteth up the beggar from the dunghill, to set them among princes, and to make them inherit the throne of glory: for the pillars of the earth are the Lord’s, and he hath set the world upon them.9 He will keep the feet of his saints, and the wicked shall be silent in darkness; for by strength shall no man prevail”. This year is our year of Spreading, so I pray for you that God will grant you a divine lifting that will spread your fame in Jesus name, Amen. The Bible Text 1 Samuel 2:6-9 is the account o Hannah, when she was desperately in need of a Child. She had been molested, abused by the other wife Peninnah. The day came that it dawned on her, she needed and wanted to be lifted amongst the barren. She remembered the Lord and cried unto him. The Lord answered her, and gave her a gift of an extra ordinary Son “Samuel” – the prophet we read about today. No one could have given her. Our God is a mighty God and He is mighty to save. Whatever situation you find yourself, The Almighty is alive and would save you. Another example of divine lifting is the account in 2 Samuel 9:1-13. It is the story of Mephibosheth, Jonathan, David and Saul. The whole story detailed how King Saul and his son died at war , Mephibosheth who could have been the next heir got lame at age 5 and was taken away ; forgotten during the war crises. Young David was made King but on one fateful day, David remembered that his friend Jonathan had a son. He asked if there was anyone left in the lineage of Saul and Jonathan, for the sake of Jonathan; he would bless such a person. Mephibosheth was summoned; all that belonged to him was given back to Him. Mephibosheth had been forgotten but his day of divine lifting came, all wasted years were restored and his fame spreads. Mephibosheth had referred himself to a dead dog that has no value. Some Christians are living like that today but I declare today as your day of lifting. The Lord will remember you henceforth and lift you up. Divine lifting is synonymous to supernatural acts of God in one’s life. Divine lifting is God’s promotion, when God promotes you no man can demote you. Divine lifting is appositive change in the life of a man. With divine lifting; an ordinary man is made great and will sit with honorable men. Divine lifting brings people from dust to the throne. When God decides to visit you all atmosphere will change for you. Another example is our father in the Lord, Daddy G. O. He was lifted from an ordinary person to somebody to be set aside for glory; even his doctorate could not give him such glory. Esther 2 gives account of Esther a slave girl in a foreign land made Queen. The wife of the King was put in a position where she had to disobey; the subordinates turned the heart of King to choose another wife. Amongst all the maidens Esther was favored and chosen. Another example is Mordecai; who happened to be Esther’s’ Uncle. The Bible records that the King was unable to sleep, restless; he began to open the books and read about how Mordecai saved the Kings life. The incident had happened a long time ago but at the appropriate time Mordecai was remembered and lifted up. I employ today not to lose hope, as long as there is life, there is hope. Be consistent, committed and remember that the Lord liveth. Genesis 1:57 confirms the life of Joseph. He went through a lot of diversities, from been sold by his brothers, to a slave, to be accused of fornication, thrown into prison and forgotten. At the Prison Joseph met some of the Kings attendant interpreted their dreams and once they were free; they forgot all about Joseph. Well, Joseph was forgotten not because the Kings staffs were ungrateful but because it was not yet time. Note, God does not share His glory. The people who are to help you are not helping you because God has not giving them permission and it is not yet time for you to be announced. At the appropriate time, the King had a dream that no one could interpret except Joseph; he was remembered at last. God did it so much that Joseph was made a Prime Minister in a foreign land, even the King had to depend on him. I pray for you today, God is giving you a divine upliftment and everyone would look up to you in Jesus name. Another example is the story of David, how he was made King. Samuel said, we are not going to seat until he comes. The Bible declares that immediately David was anointed, things changed in his life. When King Saul was sick, David was called to play the harp and King got better as a result of the anointing on David. I declare today that you are a solution provider. Like Elisha God will give you double fresh anointing, and double blessings for your trouble in Jesus name. 1Samuel 16 states that David became King and God was with him. Divine lifting is not just taking a step forward; it is taking so many steps together that people will become to wonder how you did it. 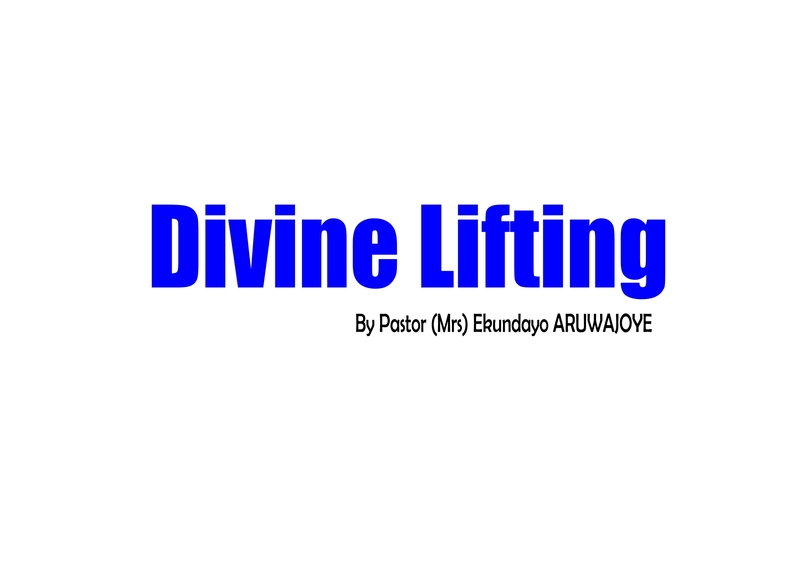 Why must you have divine lifting? It will bring glory to your maker. The bible records the story of David when he was dancing and the wife accused him of not been ashamed and David answered, I will dance to the Lord who removed your father and made me King. Always ascribe glory to the Lord in all things. John 14: 13 “And I will do whatever you ask in my name, so that the Father may be glorified in the Son”. God will give you divine lifting but God’s name must be glorified. Divine lifting will give you peace that you need. Lifting that comes from God. It will serve as a magnetic force to give glory to God again and again. Have you ever wondered why our father in the lord, Daddy Adeboye continually praises the Lord? Because he was divinely uplifted. It is and will be convenient to serve God instead of man. Our God is merciful and his mercies endureth forever. Is it not convenient to serve such a God? How can I connect to Divine Lifting? 1 John 1:9- “If we confess our sins, he is faithful and just to forgive us our sins, and to cleanse us from all unrighteousness” . Repent of any known sins and unknown sins. Live a holy life- “Because it is written, Be ye holy; for I am holy”. Be holy, keep your body holy. Some people say it’s my life; I live it the way I want. It is a lie. Do not become a testing ground for everyone all in the name of marriage. Be a giver. Solomon was a giver and God gave him what no one could give. Learn to contribute to Gods’ work so you can be divinely blessed. Be a soul winner, an incurable one. For the Lord God Almighty will not forget your labour of love. Connect yourself to the word of God. Note: Anointing is a point of contact for divine lifting. David was anointed and the anointing caused tremendous changes in his life. Isaiah 10:27 “And it shall come to pass in that day, that his burden shall be taken away from off thy shoulder, and his yoke from off thy neck, and the yoke shall be destroyed because of the anointing”.